Today it would be a shock to meet a gamer who hasn’t heard of "Pac-Man." The game, as well as our hungry hero, have become icons of arcade games and ‘80s pop-culture, thrusting video games from a fad into a phenomenon. "Pac-Man" spawned its own market beyond just video games with toys, clothes, books, cartoons, even food products, and it all started with a little idea for a game about eating. Namco, a major developer of mechanical arcade games, had been a well-established company in Japan since they started up in 1955, and by the end of the '70s were already major players in the video arcade market thanks to their first game, Gee Bee (an elaborate take on Breakout) and their first space shooter Galaxian (inspired by "Space Invaders"). One of Namco’s lead designers, Tōru Iwatani, who had previously designed Gee Bee and it’s subsequent sequels, sought to make a game that would cater to both a male and female audience. There are several theories as to how Tōru came up with Pac-Man, the most popular being that Tōru saw a pizza missing a slice and became instantly inspired. Regardless of how he came up with the idea, the one thing that has been confirmed for sure is that he wanted to make a game where the main action was eating. During a time where most games were either Pong rip-offs or space shooters where the goal was to kill, the idea of a non-violent eating game was unfathomable for most, but Tōru along with his team were able to design and build out the game in 18 months. Under its original title "Puck-Man," the game released in Japan in 1979 and was an instant hit. As they now had had a big success on their hands, Namco wanted to release the game to the U.S., which along with Japan was the biggest market for arcade games. The problem was they didn't have ​distribution channels in North America so they sub-licensed the game out to Midway Games. With concerns that the name Puck Man could easily have the "P" change into an "F" by pranksters with a magic marker, the decision was made to change the name of the game in America to "Pac-Man," a moniker that became so synonymous with the character that the name is now used worldwide. "Pac-Man" was a monumental, record-breaking success in the U.S. Launching the character into stardom with both arcade and popular culture. Soon every arcade, pizza parlor, bar, and lounge were scrambling to get an upright or cocktail table cabinet of the most popular over eater of all time. 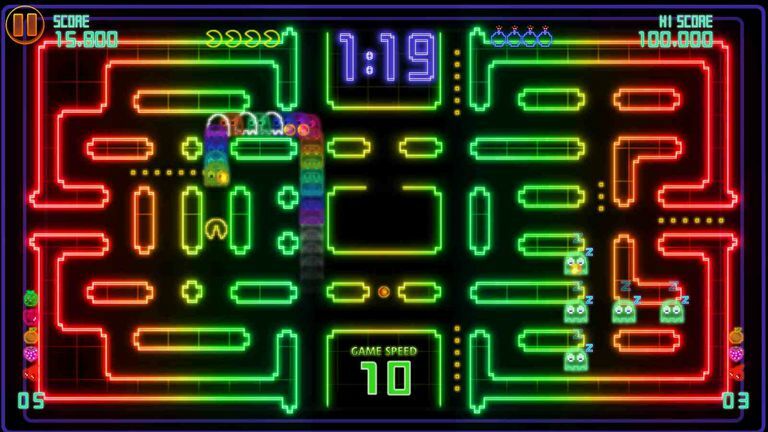 Pac-Man takes place in a single screen outfitted with a maze populated by dots; with a ghost generator in the lower center, and Pac-Man fitted at the lower half of the center screen. The goal is to gobble up all of the dots in the maze without getting caught by a Ghost (referred to as Monsters in the original game). If a ghost touches Pac-Man then it’s curtains for the little yellow overeater. Of course, Pac-Man isn’t without his own weapons, on each corner of the maze is a power pellets. When Pac-Man eats one the pellets the ghosts all turn blue, indicating that it’s safe for Pac-Man to put the chomp on them. Once eaten, the ghosts turn into floating eyes that make a dash back into the ghost generator for a new set of skin. While Pac-Man gains point by gobbling dots and power pellets, he gains bonuses for every ghost he eats, and even more when he chomps on fruit that randomly pops up in the maze. Once Pac-Man eats all of the dots on the screen, the level is completed and brief cinematic plays showing Pac-Man and the Ghost Monsters chasing each other around in different scenarios. This is one of the earliest examples of cinematics between levels, a concept that was expanded upon to include a narrative in 1981 with "Donkey Kong." Each subsequent level is the same maze design as the first, only with the ghosts moving faster, and the effects of the power pellets lasting for shorter periods of time. The game was designed to never end, potentially going on forever or until the player loses all of their lives, however, ​due to a bug it can't be played past the 255th level. Half the screen turns into gobbledygook, making it impossible to see the dots and maze on the right side. This is referred to as the kill screen since the bug kills the game. To play the perfect game of "Pac-Man" requires more than just eating all of the dots in every screen, it also means you have to eat every fruit, every power pellet, and every single ghost when they turn blue, and never once losing a life, all within the 255 levels ending with the kill screen. This will give the player a grand total score of 3,333,360. The first person to ever play a perfect game of "Pac-Man" was Billy Mitchell, who was also the high score champion in "Donkey Kong" and the subject of the documentaries "The King of Kong: A Fistful of Quarters" and "Chasing Ghosts: Beyond the Arcade." Pac-Man remains one of the most iconic characters in video games. His influence on pop culture is vast and there is a weird association between Pac-Man and Christmas.